Place chipotle pepper in a heatproof bowl and cover with hot water; soak 10 minutes, remove stem and dice. 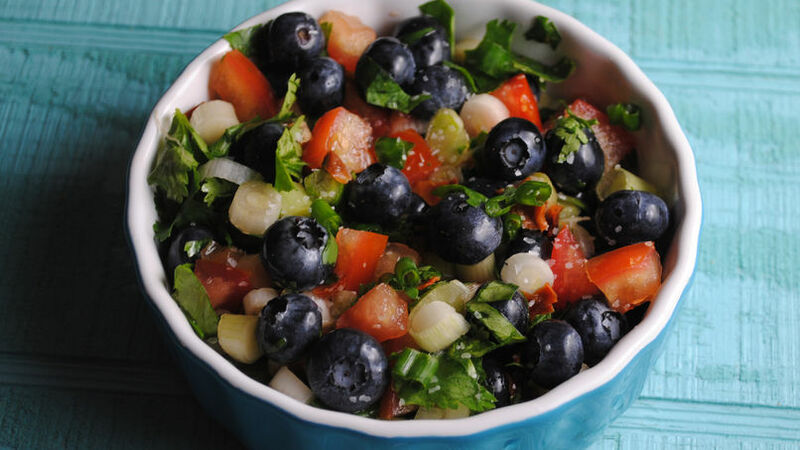 In a bowl combine blueberries, tomatoes, green onions, diced chipotle pepper, cilantro, lime juice, salt and pepper. Stir to combine. Refrigerate until ready to serve. Dried chipotle can be substituted with fresh jalapeno or serrano. You can rehydrate the dried pepper the day before for easier prep time. Nothing beats the taste of fresh summer berries. Whether baked, made into ice cream or eaten fresh, these tiny blue jewels pack a punch. This summer, why not try adding blueberries to a fresh salsa? Paired with scallions, cilantro and chipotle, this salsa is light, bright and goes perfect with any dish. The chipotle pepper’s subtle smoky flavor balances the sweet juiciness of the blueberries. Serve with fish, chicken or over quesadillas.